I truly stand by the belief that traveling is always money well spent. Where do I even start? For me, traveling opens up my mind and heart to a whole new idea of life. It changes me, and every time I come home I feel lighter, yes I said lighter! Getting to experience a new culture always makes me feel like I have a new perspective to take back home with me. With that being said, traveling also doesn’t have to be expensive. 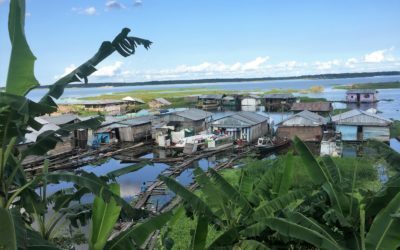 I often hear people express that one of the reasons they haven’t started to travel is because they don’t think they have the money to do it. Not true! Sure, a lot of that comes down to prioritizing what you want to spend your money on. It also depends on how you plan your trip! Personally, I like to watch out for good deals on flights, hotels, and trip packages. It’s totally doable. 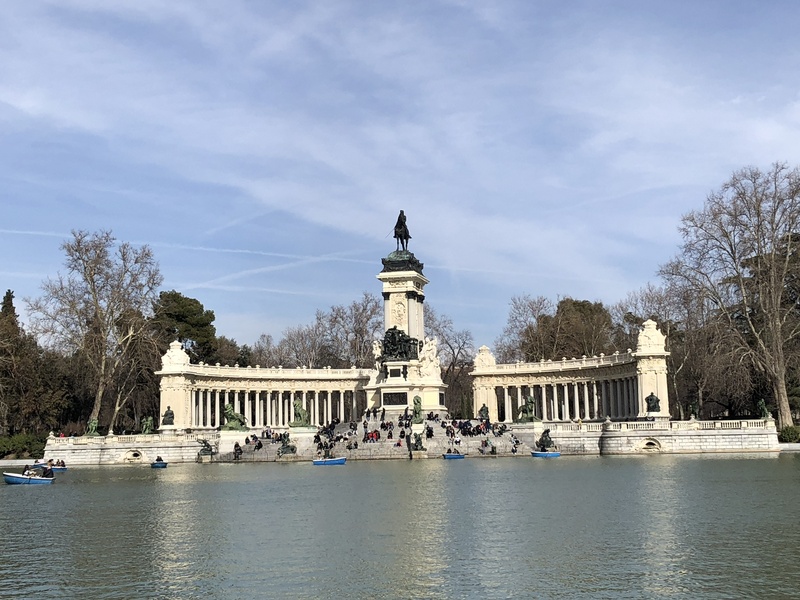 For example this trip to Spain, I got roundtrip flights out of LAX to Spain, plus hotel accommodations in Barcelona and Madrid (with breakfast) for $1000 USD each person for an 8-day trip. If you’re curious where I found this trip package, I bought it off a travel agency called Gate 1 Travel. As I’ve expressed before, I’m not one for guided tours. I’ve tried it once and it’s just not my cup of tea. Luckily Gate 1 Travel offers both guided tours and independent travel options! My boyfriend Max and I quickly discovered that you can see quite a bit of Madrid and spend very little! 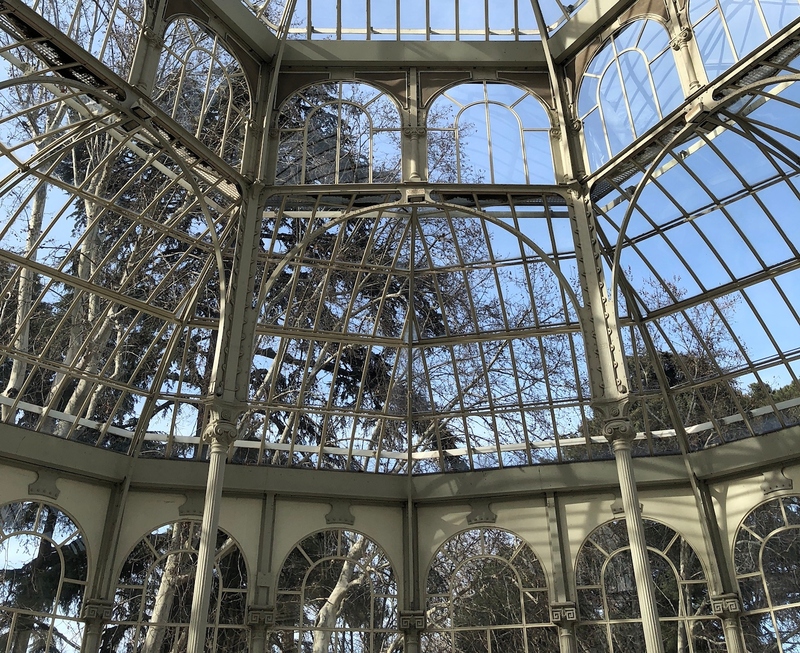 So if you’re planning on traveling to Madrid anytime soon, here’s how you can see a few of it’s beauties for 20 Euros or less! 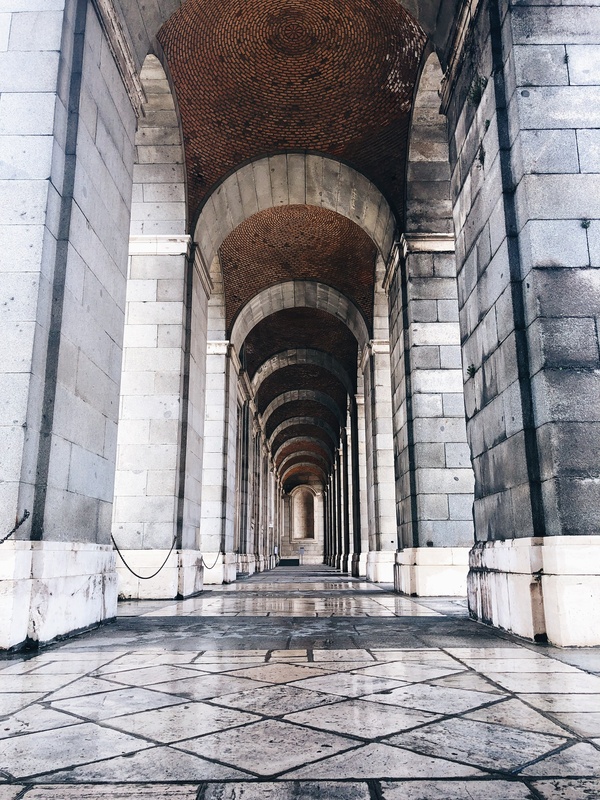 If you’re in Madrid for a short amount of time, this historic landmark is a must see! You will be mesmerized by the beautifully crafted architecture and the detail in the interior design. 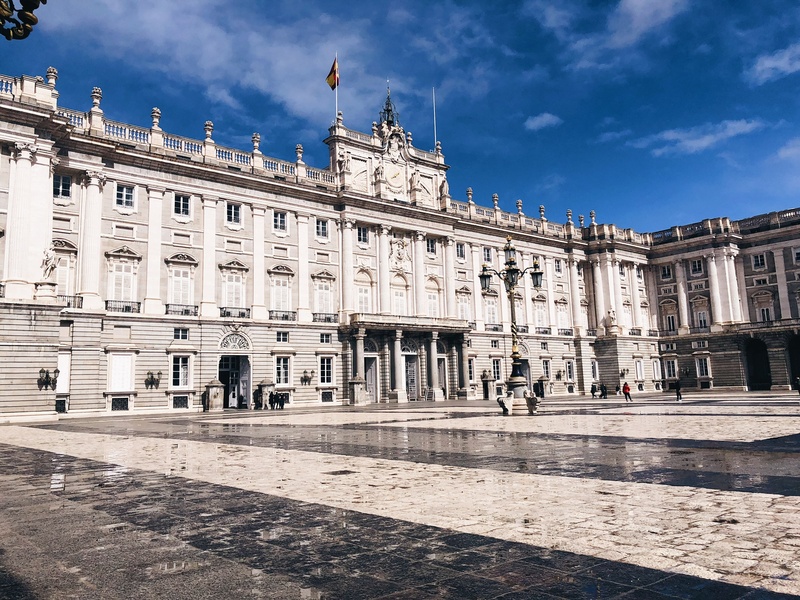 Aside from its aesthetic decadence, this palace will take you for a walk through Spain’s history and how the country rose to power. You get an unlimited amount of time to explore these unique grounds for only 10 euros per visitor! Yes, you read that right, if you purchase the basic tour ticket you get to explore the interior of the palace and the courtyard all on your own time. 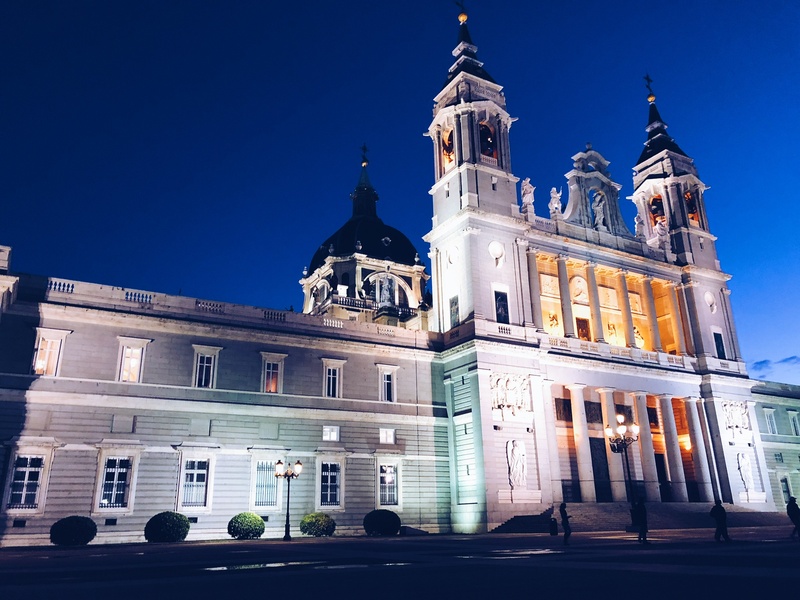 After you’ve taken your time walking through Madrid’s royal palace, walk right across the courtyard and tour Catedral de Almudena for FREE! 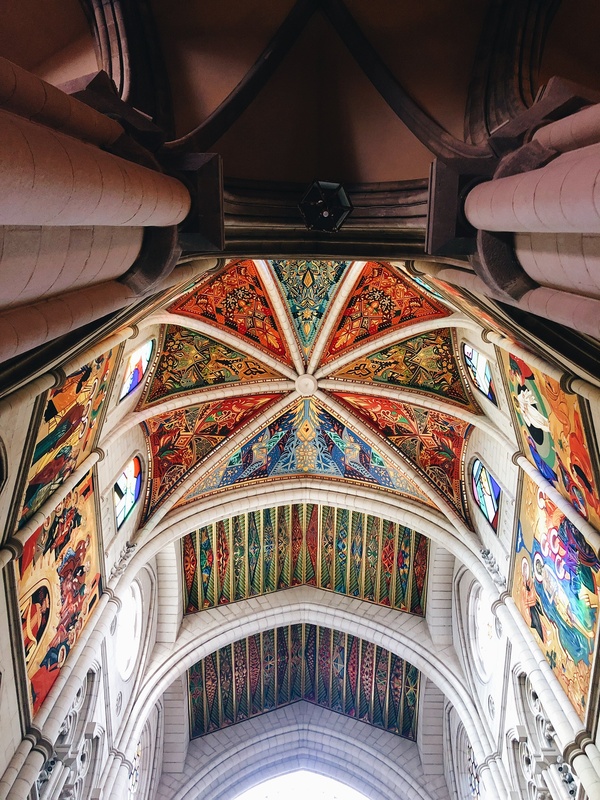 This exquisite cathedral will cost you nothing but a bit of your attention and time! Construction of the cathedral began around 1879 and wasn’t fully completed until 1993, and for obvious reasons! 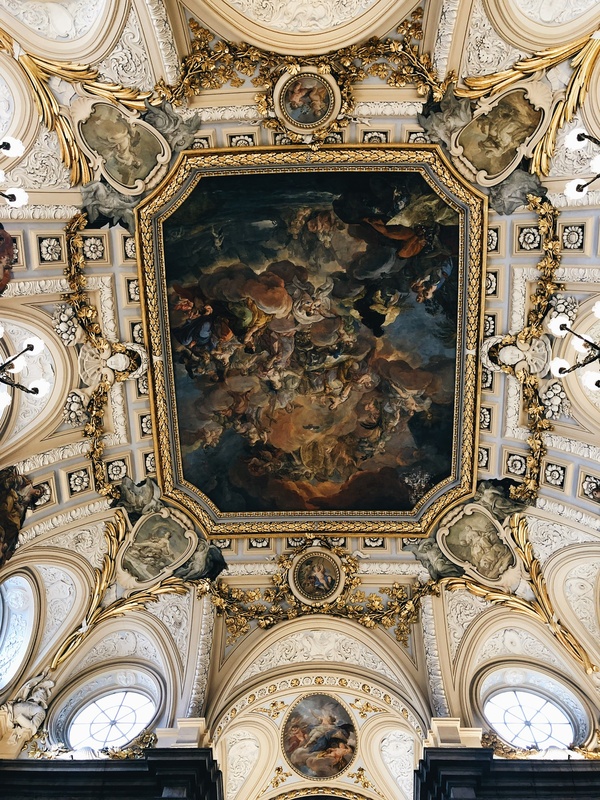 During my travels, I have been blessed to step foot in some of the most beautiful cathedrals around the world, and Catedral de Almudena is one of my favorites. There was something about the warm and vibrant colors that I truly enjoyed. This is another historical landmark that is FREE to explore! 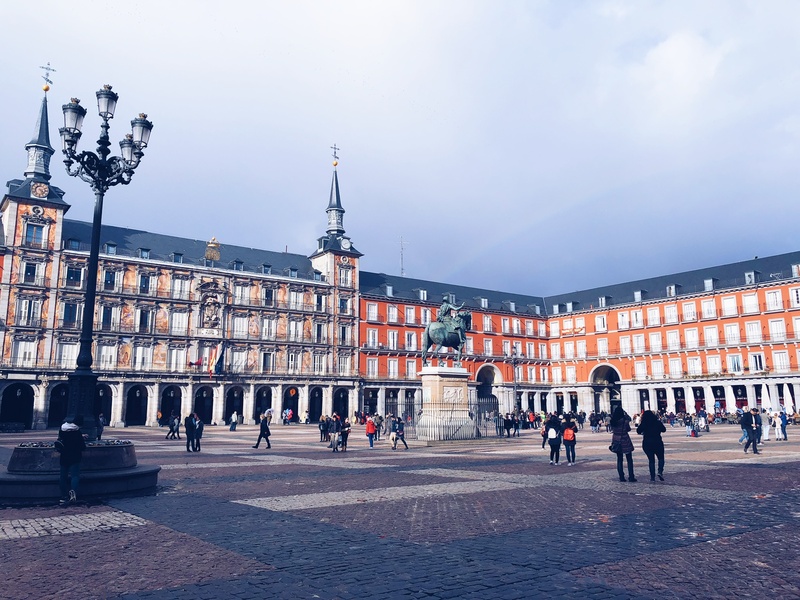 Plaza Mayor is one of the central plazas in the city of Madrid and its origins date all the way back to 1577. I would suggest doing a walkthrough of the plaza as there is so much going on inside of it and in its surrounding areas that you may even find yourself on a whole new adventure. There are also tons of shops and places to eat if you’re feeling like you need a little break. Personally, I would recommend taking a short walk over to Mercado de San Miguel. 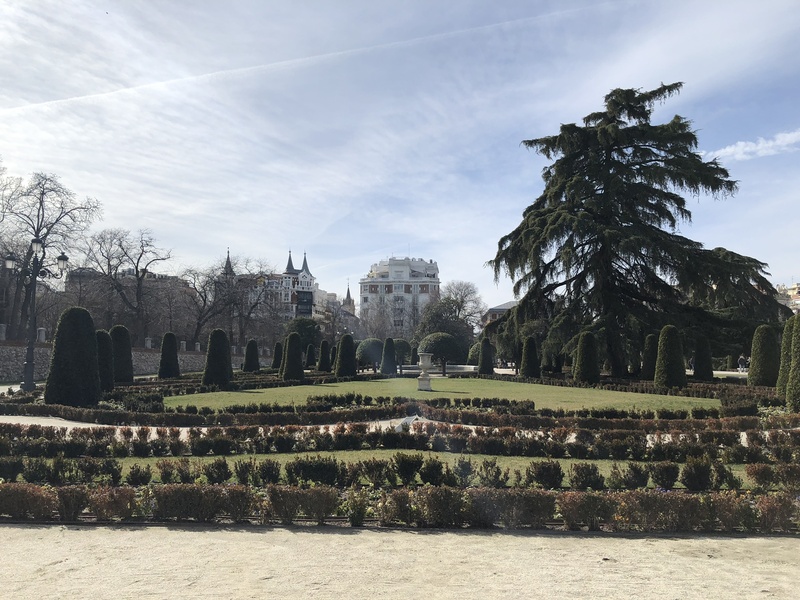 I think I left a piece of my free-spirited self in the Jardines del Buen Retiro. This one of a kind park sits on about 346 acres! Yes, I’m talking miles of green and other vibrant colors all around you. 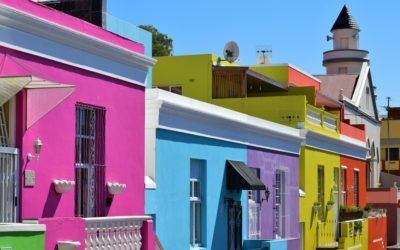 You are surrounded by tons of uniquely shaped tree’s, vibrant beds of flowers, lakes, fountains and even architecture. 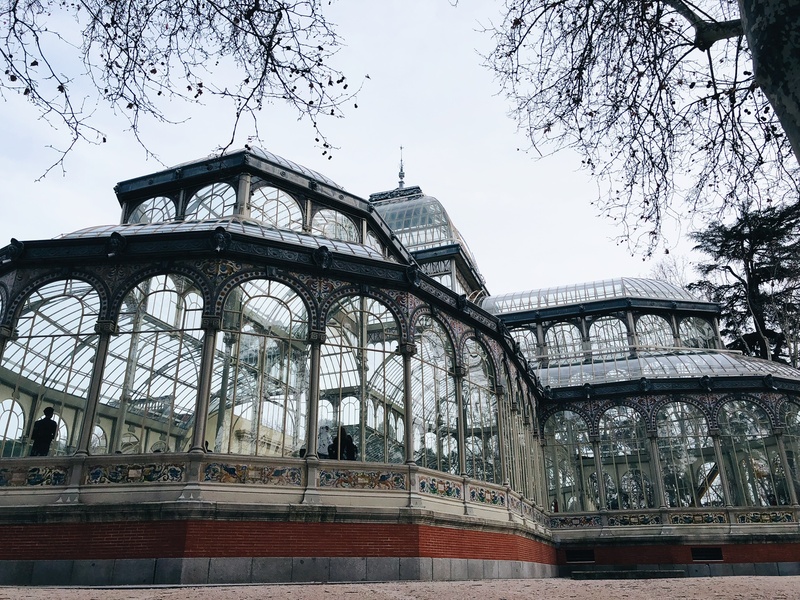 The park itself is FREE to enter and explore, including the renowned Cristal Palace which is a must see! I would say Max and I spent about 5 hours of our time in this park, and every day I wish I could go back. You can even rent a boat and take it out on the lake, this will cost you 6 euros during the weekdays and 8 euros on the weekend. Instead of going for a boat ride we opted for a glass of wine and a people-watching session of the boat rides. I like to call this LIVING. We were even lucky enough to have an amazing jazz artist playing live music right next to us. I can’t even begin to tell you how refreshing this experience was. Easy Enough on Your Own? Of course! Everything I’ve talked about in this blog is easily accessible and even within walking distance of one another! With only two days to explore Madrid, these were some of the easiest and most economical landmarks to visit. I would actually recommend walking through the city and allowing yourself to get lost in all of its beauty! Personally, I feel that this is the only true way of really getting to experience it, and if you’re lost you can always jump in a taxi and get back on track! This was my second time traveling to Europe and I completely fell in love with Spain, especially the city of Madrid. It falls in line with the mentality that I’m working hard on maintaining. What is that mentality you might ask? To really live, not to be pressured by “time” because constantly being rushed is useless added stress, and to really appreciate the person sitting in front of me. I live for long dinners or even wine dates in parks with endless conversations about everything with the people that I love. I wish I had more of that here at home. Those are priceless moments that I like to bring home with me, and that’s what makes traveling so worth it, coming home with a fresh open mind. 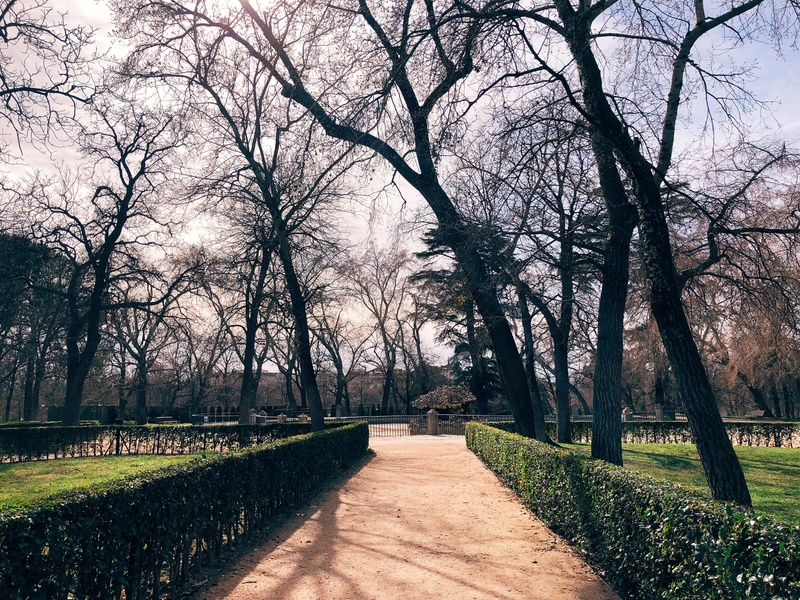 So if you’ll be traveling to Spain anytime soon, I hope you love it just as much as I do! Sydney Francisco is a Native San Diegan with a passion for exploring the world and inspiring others to do the same along the way. Her blog, Life With Sydney Marie, is driven by adventure, creating new experiences and appreciating the little things in life. Many of her pieces include lifestyle inspiration and travel advice, go ahead and take a look! Enjoy! 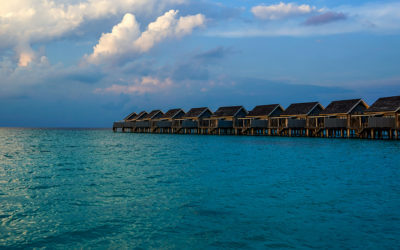 Visiting the Maldives – With Kids!